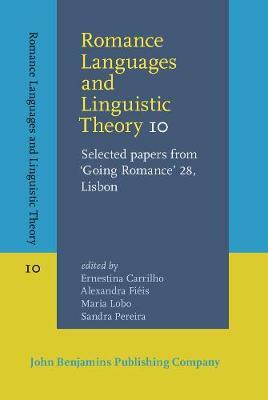 This volume contains a selection of papers of the 28th Going Romance conference, which was organized by the Linguistics centers of Universidade de Lisboa and Universidade Nova de Lisboa in December 2014. It assembles the invited contributions by Alain Rouveret, Guido Mensching, Luigi Rizzi, and Roberta D'Alessandro, and eleven peer-reviewed papers that were presented at the conference or at the workshops on Constituent Order Variation, Crosslinguistic Microvariation in Language Acquisition, and Subordination in Old Romance. The volume covers a wide range of topics in syntax and its interfaces, and brings to current linguistic theorizing new empirical grounding from Romance languages (including standard, diachronic or regional varieties of Asturian, Brazilian and European Portuguese, Catalan, French, Galician, Italian, Romanian, Sardinian, and Spanish). This will be of interest to scholars in Romance and in general linguistics.